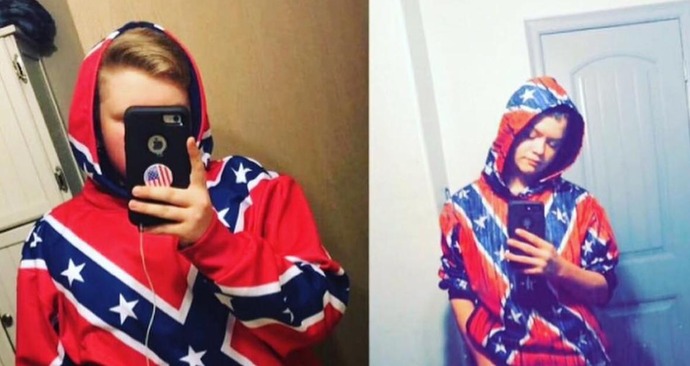 A student at Fayetteville High School in Fayetteville, Ark., has been suspended for wearing - and refusing to remove - a Confederate flag-themed shirt and face paint in support of a pro-flag movement called #HistoryNotHate. "None of us are racist. None of us are doing it for hate," said student Jagger Starnes to KARK. "It's Southern pride, and we're not gonna take it off for anyone. This is our flag. It's Arkansas. This is the South." But school officials say they aren't taking a political stance and are not trying to impede anyone's rights as an American. Instead, they're trying to keep the peace, they say. "We're not trying to trample on their First Amendment rights," Fayetteville High School Principal Jay Dostal told KARK. "We're just trying to have a safe and orderly school environment." But one teen believed that the confrontation between students and authorities got heated. Fayetteville High School student Morrigan White told local news station KNWA that he painted the Confederate flag all over his peers' hands and faces, "wherever they wanted it," and that during their lunch period, they were approached by police, the principal, the vice principal as well as school deans, "and they were all telling us we either had to wash it off or go home." But the students refused, and Starnes was the one to speak up. "I told him I wasn't going to take it off," he said to KNWA. "So then I went to the office, had a discussion and then the head principal ended up calling me racist," he says. According to the school district's rules, "attire that disrupts the educational process or otherwise interferes with the rights or opportunities of others to learn or teach [is considered improper and unacceptable]." Dostal says the Confederate flag falls into that category and "can cause a substantially disruptive environment for some of our students." He says that by banning the flag on campus, he's keeping all students safe. The #HistoryNotHate hashtag was created on social media as a campaign to support the right of Americans to bear the Confederate flag. Critics slam the movement for promoting racist ideologies. "Maybe they should study enough history to know what the confederate flag stood for," one Twitter user wrote. "What part of confederate history are they proud of? The slavery?" White addressed this accusation by telling KARK, "The American flag was raised for slavery, too, but I mean all the flags were trying to say is we don't want to be in your nation. We want to be ourselves. We don't want to be part of this." Starnes added, "To me, it's Southern pride. It's our heritage." The students say that despite the discipline they received, they stand by their convictions and won't back down from wearing the Confederate flag. "They're both going to keep wearing their jackets," White said of Starnes and another fellow student. "And if I have makeup, I'm going to put hashtag history not hate on my hands. I'll still keep putting the flag on my face." Yahoo Lifestyle has reached out to Fayetteville High School to ask how it plans to handle the situation going forward and will update this post with new information.